My painterly style is a unique way of painting with pixels. 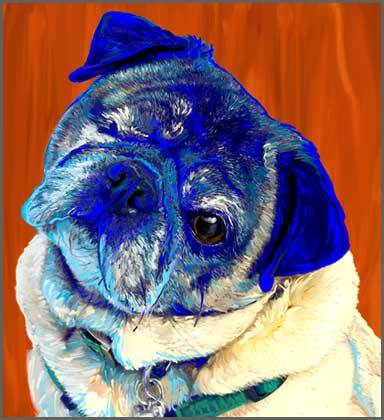 Many digital artists rely heavily on photoshop filters alone to achieve their results. There is nothing wrong with filters and we use a variety of them in all of our artwork. Where my painterly style differs is in the addition of hand drawn lines and painting smudges that create a really rich and texturally layered look. 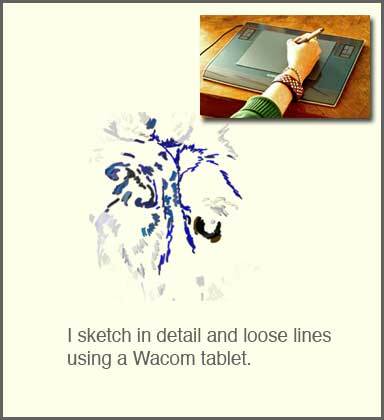 All of my drawing and painting is created by hand with a pressure sensitive electronic tablet by Wacom. 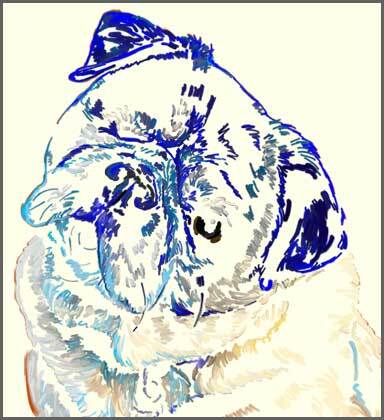 Below are some very basic screen shots of Jake the pug's artwork in progress. The actual original art file has dozens of layers and way too many steps to be shown here. 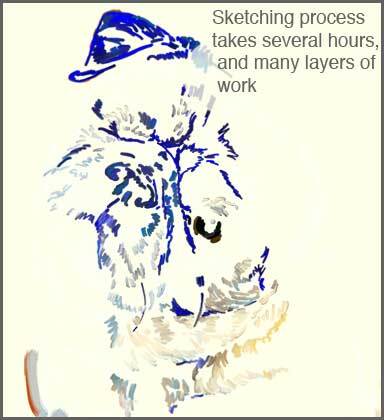 I am presenting just a few images to give the viewer a very basic understanding of my process. Be sure and scroll down to see all of the image shots. 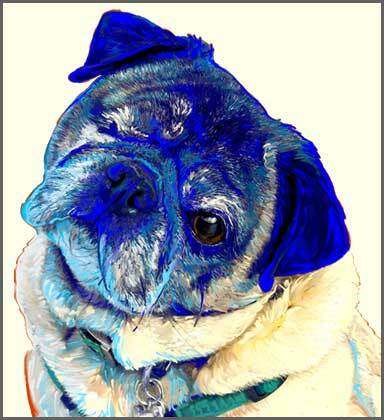 Image above shows the sketch layers with a filtered and color altered photo layer beneath them. Once I reach a certain point the sketching and smudging phase is over. It is often hard to know just when that point has arrived, as I could work a piece for months and discover something new in the art each day. Since most clients don't want their artwork to take months I move on. My next step is to play around with background options and at this point I can even create a duplicate file and colorize the subject with an entirely new palette. I always like to show my clients a few options, while letting them know my favorite pick. 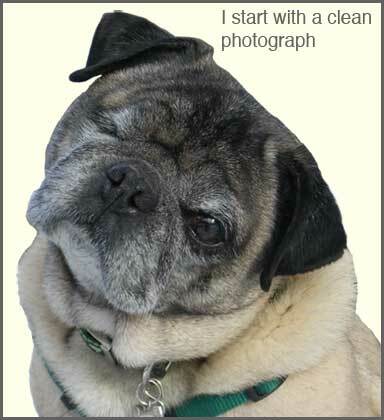 A Side Note: "Eye surgery" on Jake using Photoshop would have been quite possible, however we would never suggest correcting anything on a pet that is so obviously part of their personal history and unique story. I think Jake is quite perfect the way he is and my goal as an artist is to just enhance a pet's colorful personality with even more color. No digital plastic surgery for Jake! Celebrating our 10th year in business! ©1998- 2005 artpaw.com All rights reserved.